Victoria Miro currently presents Jules de Balincourt’s Itinerant Ones, the first solo exhibition in the UK for the Paris-born, New York- based painter. 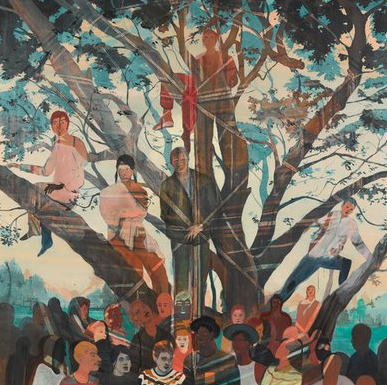 Known for his carefully constructed paintings that move effortlessly between abstraction and figuration, the imagined and the real, this new body of work sees De Balincourt moving away from direct references to current social, political or popular culture, and instead depicting a world in which indications of specific place or time are absent. Although the works are diverse in subject matter, throughout the exhibition a poetics of free-association lends the images a certain universal familiarity. 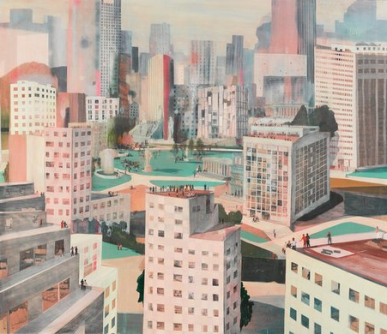 In works such as the cityscape ‘High and Low’, the acid-bright leisure scene BBQ sur l’herbe, and the painting from which the show takes it’s title, Itinerant Ones, De Balincourt zooms out of specific culture into a more global gaze. Juxtapositions of works such as Firepeople and Visionquest, where figures come together in hopes of spiritual enlightenment, with Alex, an intimate portrayal of a friend on the beach, locate De Balincourt’s interest in both personal and social depictions of humanity.